I absolutely love the combination of mint and chocolate. Granted, it’s not for everyone, but for me it’s one of the loveliest sweet and fresh flavour combos around. You can enjoy this little pudding for dessert, as an afternoon energy booster or you could even have it for breakfast if you feel like it. It’s creamy but light and beautifully cooling during the warmer months. If you don’t need this to be low fodmap, feel free to add more chia seeds. This recipe calls for 2 tbsps per person in keeping with the low fodmap serving size. Optional: 1 teaspoon coconut sugar or sugar/syrup of your choice. In a small bowl, mix all the chia pudding ingredients together and set aside for at least 15 minute (you can leave them in the fridge over night if making in advance). In a separate bowl, mix the yoghurt, mint and spirulina until it’s smooth and beautifully minty green. Taste and add more mint and a touch of sugar if necessary. 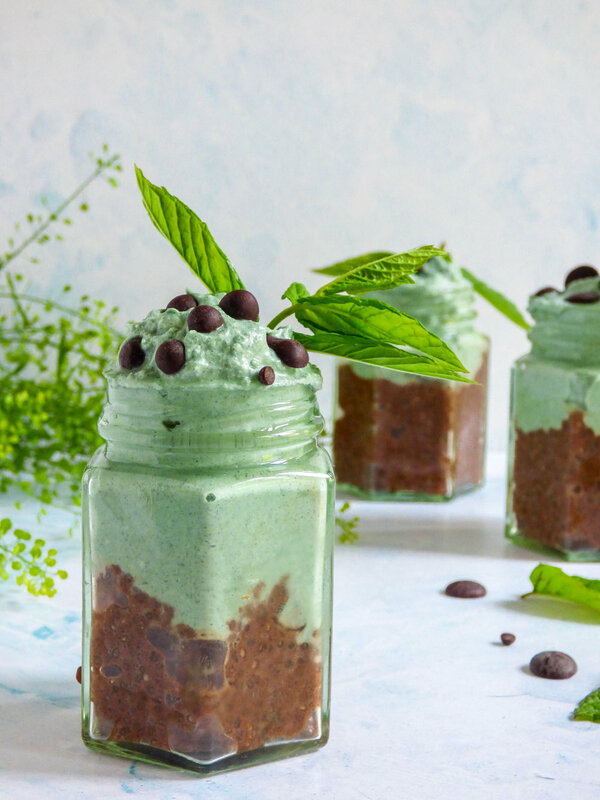 To assemble, layer the chia pudding in a glass or jar then top with the mint yoghurt and some chocolate chips or cacao nibs. Enjoy.